Three Energi Simulation team members, Andrew Seto, Ricardo Garza and Sima Kohbodi, attended CMG’s Technical Symposium at the Eau Claire Sheraton Suites on June 4-5, 2018. 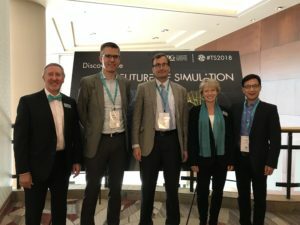 The biennial event showcased the latest research and development in state-of-the-art reservoir simulators and case studies to the industry, ranging from improvement in computational speed to inclusion of artificial intelligence in reservoir simulation for both conventional and unconventional resource development. Their CoFlow, an integrated asset modelling tool, is one of the highlights, as this modern IPSM solution could help companies optimize their operations and maximize the economic returns of their assets by integrating the entire workflow/process of reservoir development from subsurface, to wellbore, to surface facilities. Energi Simulation Co-Chairs at Heriot-Watt University, Dr. Sebastian Geiger and Dr. Eric Mackay, were also invited as guest speakers to present their research work on “Flow Diagnostics for Naturally Fractured Reservoirs” and “Reservoir Aspects of Oilfield Scale Management” respectively. Overall, the symposium was very well-attended and well-received by the participants. 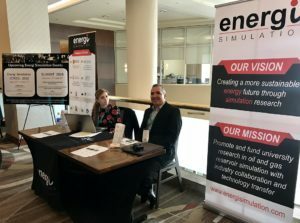 We look forward to further collaboration with CMG Limited, as Energi Simulation’s Research Chairs continue to generate useful research results and new technologies that could be transferred to benefit the industry and society.